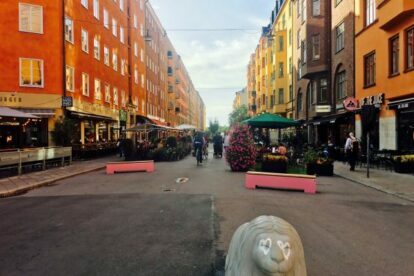 When going for a stroll and a spontaneous restaurant visit, a bar, a terrace to watch people, or even bowling: Rörstrandsgatan is a street where you can find multiple options and won’t get bored easily. Right at the exit at St. Eriksplan metro and ‘tunnelbana’ you will find your way to the entrance of this street. In summer, I often visit Mellow Bar on one of the corners, since there is sun until after work hours, and later move into Tiki Room in their basement, after dark, as they have the most interesting cocktails in Stockholm. You will also find many nice cafes and pubs to just have a coffee, a beer, or even a breakfast buffet on the weekends. Just right of the street by the tobacco shop on the right, you have Birkagatan, where I have gone bowling at Birka bowling in the evening hours many times. There are some cute arts & craft shop to buy incense, gifts and art in the area too. Or even if you just need a simple supermarket, there are two to find. To extend your exploration of this cute little pedestrian street (in summer at least, in winter time cars, can pass), you could walk down through the tunnel at the end of it and even find a park area at the waterside next to Rörstrands Slott, an old ‘castle’ that has now turned into an army training base.